Emily Coker is a "multipotentialite" who is passionate about empowering herself and others through hands-on learning and making. When not creating projects for the masses, she can be spotted tinkering around in her shop futzing with electronics, robotics and the latest in tech and craft. She currently works at Google X.
It’s always great to hear about young people doing good things for humanity. Easton LaChappelle not only blows my mind but is a huge inspiration. The 19 year old recently accepted a job with NASA after creating a 3D printed prosthetic arm that is controlled by your mind. LaChappelle become interested in robotics and technology at age 14. (Yes, you’re reading that right.) 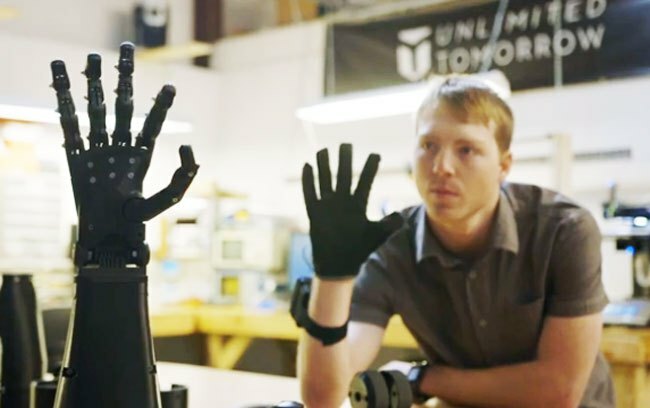 Noticing the high prices of prosthetics and the lack of technological advancement, he set out to create an affordable prosthetic arm for under $1,000. Working out of his home in a small town in Colorado, he taught himself 3D printing, robotics, and programming. It seems that nothing stands in his way with a goal! He has released the design for his current prototype (made for about $400) as open source, opening many doors to advancements in prosthetics and robotics. LaChappelle is the subject of the first video in a series called Luminaries on UPROXX about some of the most influential individuals in science and technology. You can also watch his TED Talk. Easton LaChappelle is a prime example of how wonderful the world of making is and how one person can inspire a movement.